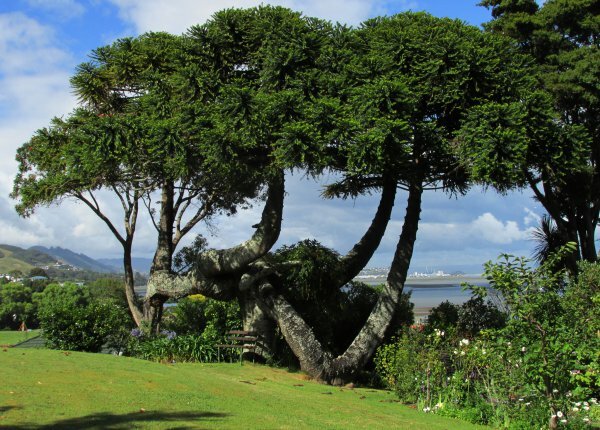 A very curiously formed tree and unlike any other Bunya Bunya recorded in New Zealand. The tree is located in front of a dwelling and it is presumed to have been 'topped' many years ago for the view. Four tops have grown from the three metre high stem. Over the years, each stem has developed a long sweep, with one of these now resting on the ground. Subsequent pruning has created a stunning vista through the lower canopy (Cadwallader, 2014). 08 Jan 2014 Cadwallader, B.G. Beside the drive, directly in front of the house. No public access.